# every time the program runs. # We model a single neuron, with 3 input connections and 1 output connection. # The Sigmoid function, which describes an S shaped curve. # normalise them between 0 and 1. # The derivative of the Sigmoid function. # This is the gradient of the Sigmoid curve. # It indicates how confident we are about the existing weight. # We train the neural network through a process of trial and error. # Adjusting the synaptic weights each time. # Pass the training set through our neural network (a single neuron). # and the predicted output). # Multiply the error by the input and again by the gradient of the Sigmoid curve. # This means less confident weights are adjusted more. # This means inputs, which are zero, do not cause changes to the weights. # The neural network thinks. # Pass inputs through our neural network (our single neuron). #Intialise a single neuron neural network. # and 1 output value. 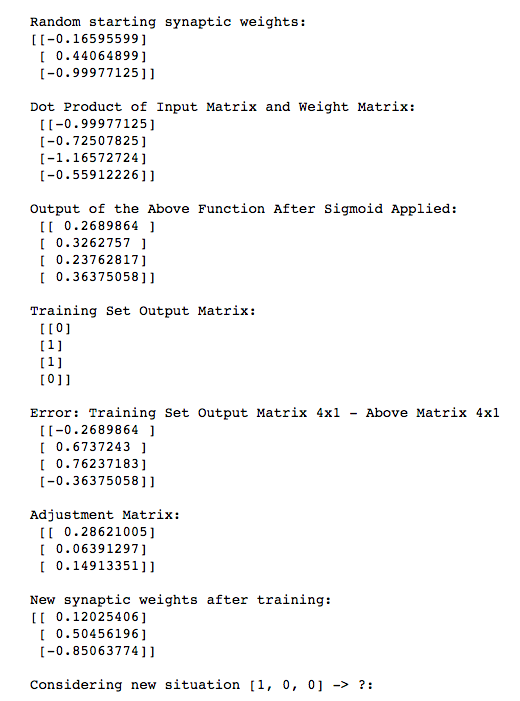 # Train the neural network using a training set. # Do it 10,000 times and make small adjustments each time. # Test the neural network with a new situation.